Inventory We are a resale marketplace, not a box office or venue. Ticket prices may exceed face value. This site is not owned by Chaifetz Arena . 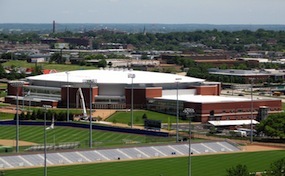 The Chaifetz Arena located on the campus of Saint Louis University, is a 10,600 seat multi-purpose arena in St. Louis, Missouri that began construction on August 28, 2006 and opened on April 10, 2008. The Chaifetz Arena has hosted concerts by the likes of Phish, Barry Manilow, Lady Antebellum, Sir Elton John and American Idols Live. ArenaStLouis.com is a privately owned and operated website that operates exclusively in the secondary ticket market. We are not an official supplier, website, and or box office. Prices for events may be well below or above face value and will fluctuate quickly with demand. To order tickets for all Chaifetz Arena St Louis events please complete the online steps through the checkout.